mental discomfort. This books takes you right into the lives of the jihadists where they tell you their story before their death from the beginning. 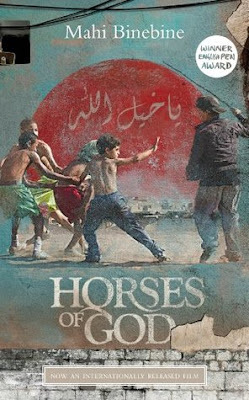 In Horses of God, the boys are marginalised, their parents couldn't care less as they've got a lot to deal with themselves. These children are easily manipulated, their young minds get tapped into and in a blink of an eye they are being convinced that others are the reason their life is meaningless. Mahi Binebine is the first Moroccan novelist whose book I have read, I look forward to reading more from the country. My first read of 2018. The novel has been turned into a motion picture and I'd like to see it. What is your first read of the year? Have you read this novel? What other novels by Moroccan writers would you recommend? Hmmm . . . I don't think I would enjoy this and yet I think I should - and will- read it. It's something that anyone in today's world should know about, and understand the underlying reasons for. Mary, you say you didn't particularly enjoy reading this, is it because of the dark subject matter? I can relate if that's the case. I have lots of books written by African-American writers in my bookcase but those that deal with the subject matter of slavery, I simply cannot bring myself to read them, no matter how brilliant the writers are. My first read of the year was "What it means when a Man Falls from the Sky" by Lesley Nneka Arimah. It was well written. The writer is clearly talented but I am not a fan of magical realism because I simply do not understand it so this is not a book I would recommend or pick up again to read. Yes, the subject matter is dark, sad and hopeless, I guess that is why I did not particularly enjoy it. I cannot deal with magical realism myself, so I believe it is not a book I'll be picking up.